Muuten turkoosin-sinisia paitsi jalat varittomia/Valm. 50-luvulta 70 luv.alkuun/Sarjasta on tehty matkittuja laseja yms. Harlekiinin tunnistaa naista matkituista siita etta Harlekiinien jalka on varitonta lasia ja itse kanta on turkoosi seka lautasmainen eli valumatkeraava. Incidentally turquoise - sine beyond stump varittomia Valm. 50- studies 70 luv.alkuun/ Relegated is tehty matkittuja laser yms. Harlequin know woman matkituista siita etta Harlequin stem is varitonta goblet and yourself stem is turquoise mixed lautasmainen or valumatkeraava. and the last word is something about casting but seriously i've never heard the word before..
What could that be? Technical term I presume. What about the original jug? Could it possibly be turn-mould-blown? Could be Rob, maybe I'll try emailing the Finnish Glass Museum and asking them. :? : Thanks for the translation Frank, how convenient knowing Finnish speakers! how convenient knowing Finnish speakers! Side benefit to living in a super-multicultural country, Carmen's last job had about 50 staff coming from 28 different countries and my last one had 25 nationalities. It was next door to the International Criminal Court which has over 100 nationalities working in it. 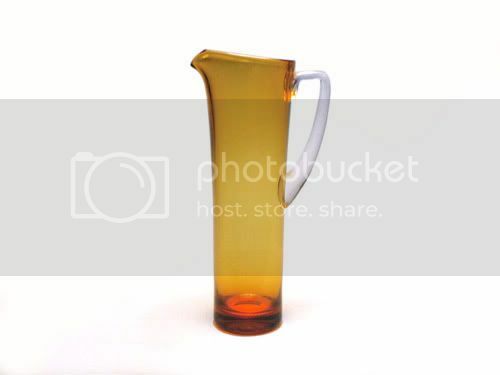 Oh, I have one of the amber jugs (in the original post) in storage somewhere. I've always just assumed Polish. I've had one of the Harlekiini jugs in the past too (in turquoise) - and they're quite different, as Pip says. Hi everyone, thanks for all your time and efforts on this one, but I think I just might have to wait another coupla years!! !LOL maybe a stickered one will turn up!! Nic love the pics, wish i could take such good ones! The Blindingly Obvious is Never Always Apparent!! Re. Nic's great photos: you need to find the thread in the Cafe about the use of Light Tents. I'll see if I can dig the topic out. Page created in 0.932 seconds with 28 queries.